Whether evaluating the performance of loudspeakers, headphones, or microphones, electro-acoustic test can be challenging. In the case of loudspeakers and microphones, extraneous noises and reflections from surrounding walls and floors interfere with the measurements. Headphones present their own challenges, owing to the close coupling of earphones to the ears and the associated acoustic transmission paths. In addition to industry-leading analog performance and the widest array of digital options, APx500 Series analyzers offer fast, cost-effective electro-acoustic test of raw drivers and integrated audio products from the R&D lab to the factory floor. With APx, engineers can use a single analyzer with a single automated project to test analog circuitry, Bluetooth connectivity and driver electro-mechanical characteristics like impedance, Thiele-Small, and rub & buzz. The result will be a single, consistent data set ready to share between collaborators, or an integrated report from the most reliable and trusted name in audio test. The APx Impedance/Thiele-Small measurement captures the complex impedance of a loudspeaker under test and delivers calculated electromechanical parameters that define the low frequency performance of loudspeaker drivers. Thiele-Small results accurately describe the interactions between loudspeaker and enclosure, and are vital to both loudspeaker system design and production test. Once a system is designed, any measured deviation from expected Thiele-Small results can quickly identify defects in manufacturing or parts quality. APx Thiele/Small supports the Known Mass, Known Volume and Added Mass methods. Added Mass and Known Volumes methods deliver accurate parameters using two-pass measurements, while Known Mass allows complete Thiele-Small characterization in a single pass. APx Rub & Buzz finds defects characterized by a high crest factor in combination with a high peak ratio when driven by a chirp stimulus. These defects include misaligned voice coils, particles in the voice coil gap, and incomplete adhesion of suspension elements to a frame. In these cases, the resulting artifacts are very transient in nature, and while very difficult to detect using standard techniques such as FFT, the human ear is exceedingly sensitive to these noises. APx Modulated Noise measurement models air leak defects as a type of weighted white noise that is modulated by a low frequency stimulus, reliably detecting leaks in enclosures due to poor seals, open jacks or construction issues. Air leaks can degrade the performance of loudspeakers, impacting design parameters and generating unwanted noise artifacts that are exceedingly difficult to detect with standard measurements, often buried in a noise floor. As compact integrated audio products push the boundaries of sound pressure and bass response, enclosure integrity is increasingly a problem that must be tested to ensure quality. Product-mounted controls and jacks compound the difficulties of creating leak-free enclosures, making the APx Modulated Noise Air Leak measurement an essential part of the electro-acoustic designer’s toolkit. APx automatically calculates all the key acoustic response measurements including level, frequency response, phase, distortion, and group delay. In all, 14 graphed measurements are returned. 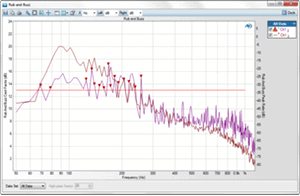 In addition, APx offers synchronous averaging and Nth-octave smoothing. 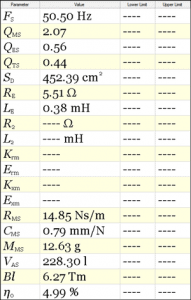 The results are available on screen, can be printed to PDF or exported in table format for use in other applications. 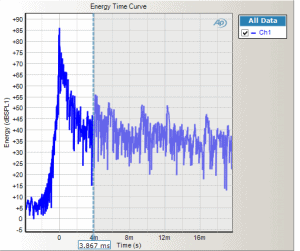 Like all APx measurements, acoustic response can be part of a larger test sequence or controlled externally from an application such as LabVIEW. AP’s waterfall and polar plots provide powerful visualization tools for understanding electro-acoustic behavior. The APx Waterfall Plot Utility creates three-dimensional graphs that display multiple curves of data that can represent changes over time or frequency. Spectrum or Cumulative Spectral Decay (CSD) views are available, with variable FFT length, number of slices and samples per shift. The APx Polar Plot Utility displays the response of loudspeakers and microphones relative to position in a plane, and supports multiple brands of turntables to produce full circle, semi-circle, quarter-circle and custom plots.